It's funny this would start immediately after a oil change. I checked the oil level 5 times and it is right were it should be. 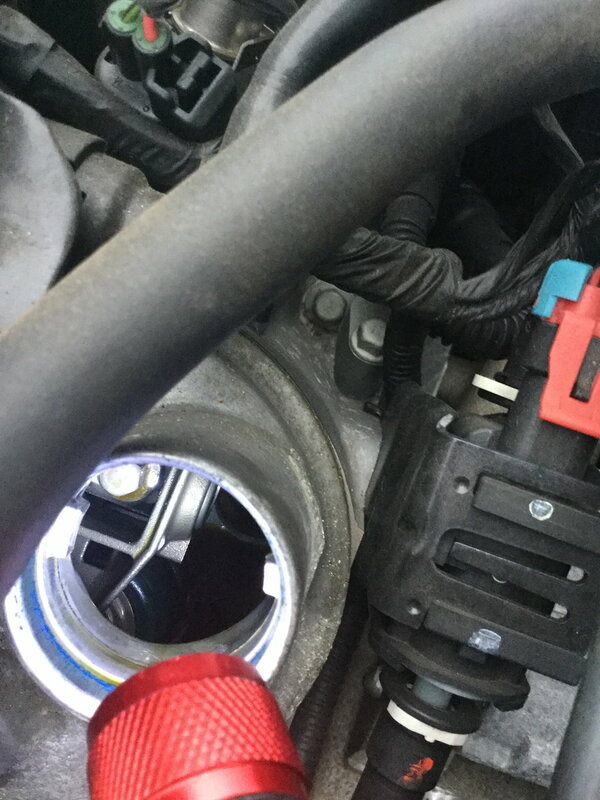 Even thou the dipstick is correct how do I know the oil is actually circulating .Could I have done something while changing the oil to cause this? Hopefully it's something belt driven outside of the engine, good luck to you, I hope it's something simple. So, nothing I told you in my post seems to interest you ? It would be helpful to post another video of the car running just slightly off idle. A bad lifter will have a pretty distinctive sound if you rev it up just a little bit. It sounds exactly like when I had a lifter problem on my'05. Never had any codes. I'll bet my money on an external interference. Never heard an aluminum part make that sound. Of course what you say interest me, I take every reply seriously that's why I ask. The HB looks perfectly normal as is everything around it. I don't know how to take the belt off. There is not that much I can do here as I am knowledge limited. I just went and started it again and it seems louder and it is definitely rpm dependent. Goes up and down with throttle. I looked in the oil cap on the head right after I shut it and it doesn't seem really wet in there. Shouldn't that be coated in oil? Here's a pic 10 seconds after shutting it off. Ok let me try that and see if you can decipher anything. Be right back. I don't know how to take the belt off. Here ya go, hope this helps, on the good side! Still sounds like a belt, or something rubbing . . . ? Or possibly an exhaust leak, which I believe has already been suggested. The curious thing to me is that it happened right after you changed the oil. That is a BIG clue because it's probably not a coincidence, but I don't know what the clue is. I'm watching Columbo in a couple of minutes -- I'll ask him, lol. You have to rule out one thing at a time. I would do what Turbo suggested and remove the belt. That would tell you a lot. Do you have any mechanically-inclined buddies that could help you? That definitely sounds like a bad lifter and it absolutely could have started as a result of the oil change. The lifters in our cars are hydraulic meaning they're fluid filled with oil. When you drain the oil the lifters tend to bleed down which is why a motor can sometimes be a little noisy on initial startup after an oil change since it takes a few seconds for them to fill up again. Even though the oil change itself didn't cause the issue, my guess is that it pushed a borderline bad lifter over the edge because after it bled down when you drained the oil, some internal fault prevented it from filling back up properly so basically instead of riding on a cushion of oil you've got metal to metal contact inside. The good news (and this is speaking from experience, not wild speculation) the motor isn't necessarily shot. At best you're looking at having to replace the lifters, at worst you may also have to replace the cam too if the lobes got chewed up. Drove it for another 50,000 miles before replacing the engine. Never had any noticable loss of power. It did get increasingly more embarrassing at stop lights.